Stock markets have finished rather down than up on the last week, however, it is important to note that money is flowing between sectors at the moment. As suggested in a market review two weeks ago, there are industries going down as well as up. NAFTA was replaced by USMCA (U.S.–Mexico–Canada Agreement) – three North American countries agreed on free trade conditions, which is good news for the market. Read more about the deal here. The US 10-year Treasury yield pierced a resistance of 3.2% – this is a 7 year record. 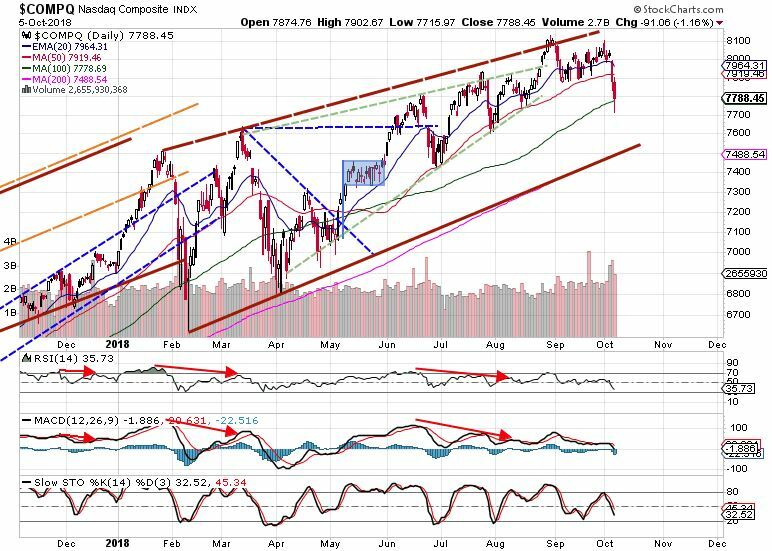 Well, investors reacted to this event and thus, we’ve seen a decline in the stocks. However, the economy is still doing well, rates are rising at a normal pace and there is no economic evidence of a possible downturn. A current dip is just a natural blip of the investors’ activity. Thus, choosing a healthy selection of stocks provides a great opportunity to profit from a current pullback. 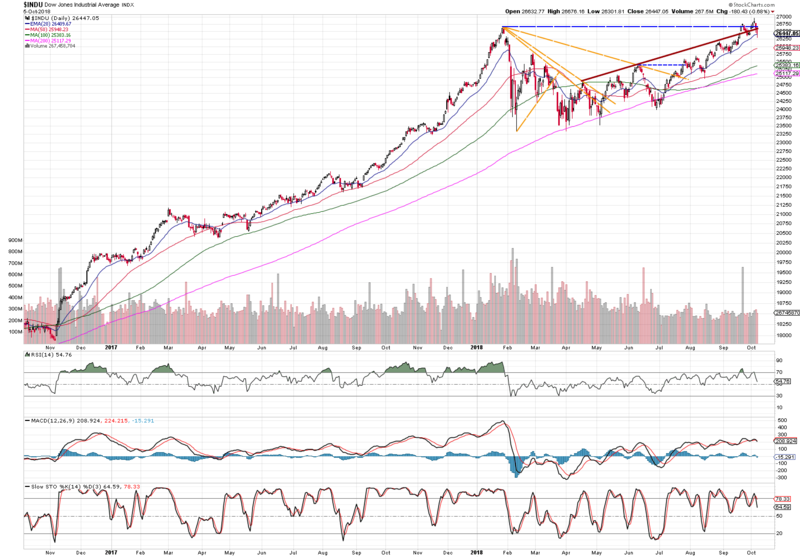 S&P has broken down its short-term support 20 EMA and managed to close 50 SMA and blue dashed line – this is an important mid-term support level – break down would mean a correction further down. 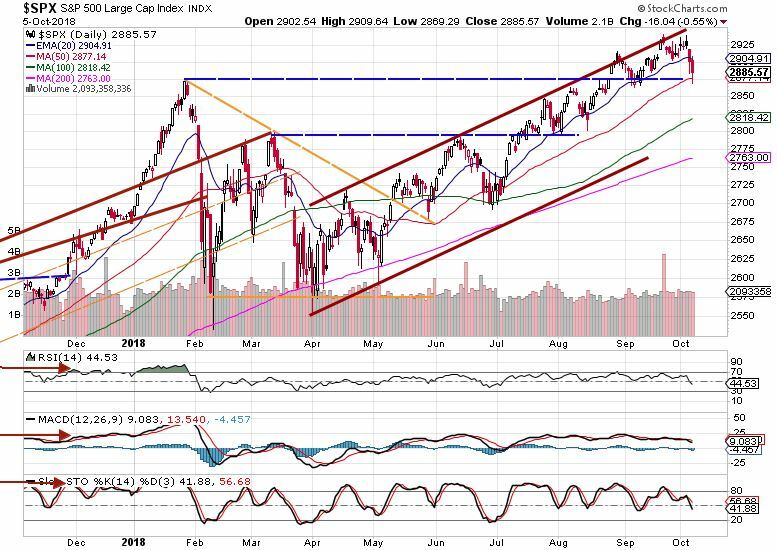 As earnings season is about to start, the satisfactory results will very likely keep the price consolidating around 50 SMA before the index goes up again. Technology sell-off has dragged Nasdaq down making it the most volatile index in the recent trading periods. Many investors may be convinced that FANG stocks got overbought and now they’re switching to other stocks or bonds. Well, the corporate earnings are going to say what their path is going to be. 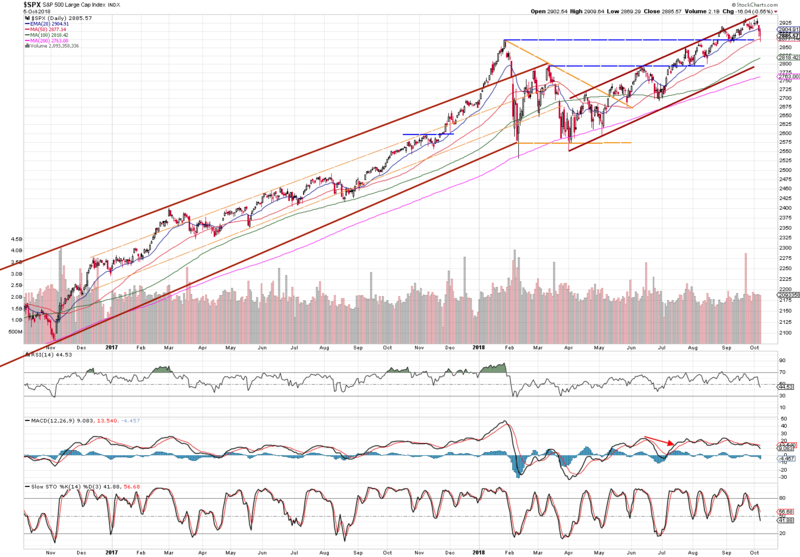 Till that time, expect volatile behavior among technology sector. The index managed to close above 100 SMA, which is its current support level. A decline underneath is going to lead towards lower trend line (brownish wide line) that serves as the lowest boundary of the current trend channel. 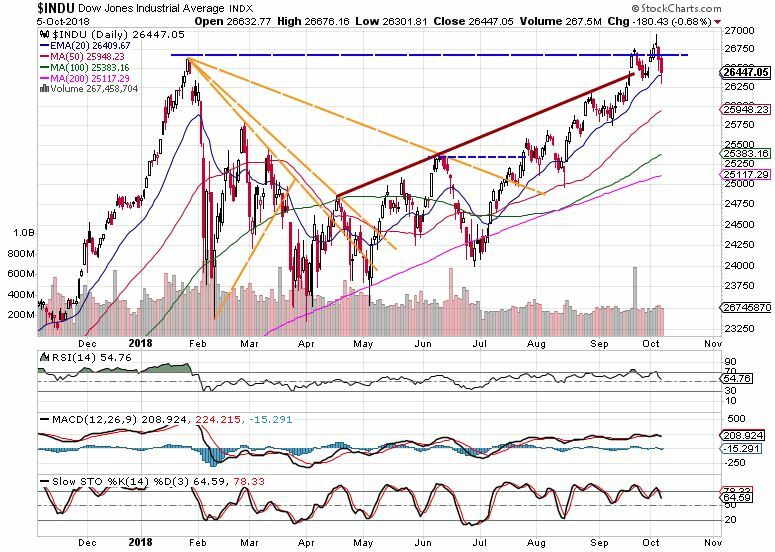 The fact that systematic risk to the entire market is not taking a place is supported by a performance of Dow Jones index. The industrials heavy index has managed to close above 20 EMA – it’s been railing this line since July! FTSE 100 is completely ignoring moving averages with little importance to 200 SMA. The yellow line servers at the moment as the current support level. Bounce from that line could spark another run upwards in upcoming weeks. This week is going to bring important economic information such as Produce Price Index on Wednesday and Inflation readings on Thursday. 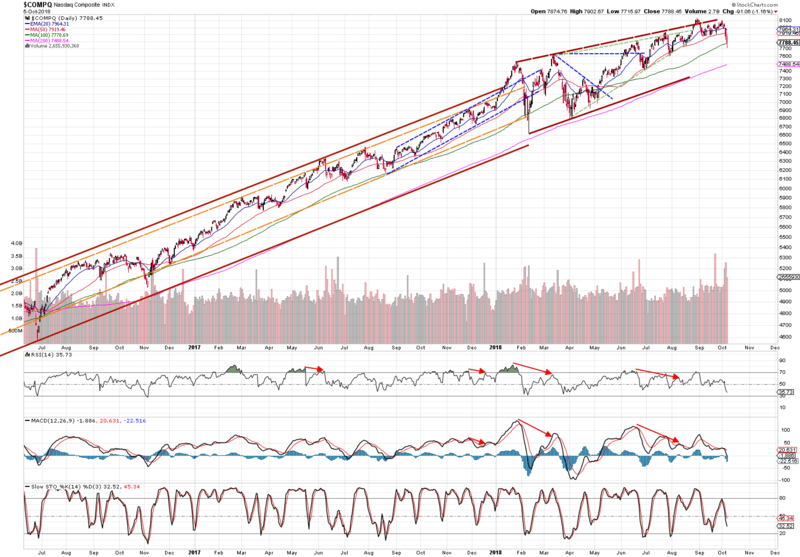 These are market-moving economic indicators, thus, watch them closely!